Each American produced an average of 30 pounds of trash per week in 2014, according to the Environmental Protection Agency. Applying that statistic to the undergraduate population at Emory, students would theoretically produce a whopping total of 237,480 pounds of trash per week. Hopefully we don’t produce quite that much trash on a campus scattered with compost and recycling bins, but there’s always more that can be done to reduce waste, even on a daily basis. That is why I pledged to go zero waste during the week of March 26. 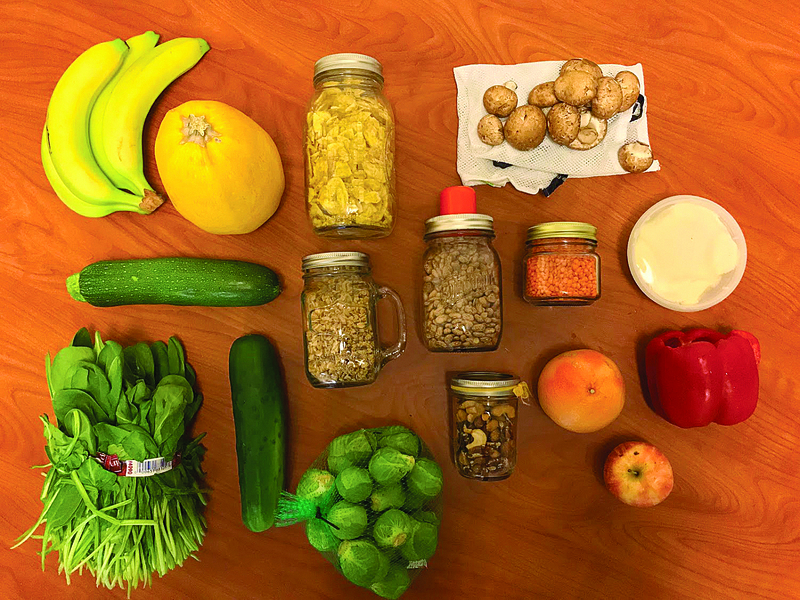 Zero Waste Week is an event joint-hosted by the Office of Sustainable Initiatives (OSI) and the Residence Hall Association (RHA) Sustainability Chairs to raise awareness and support for sustainable practices on campus. Students interested in reducing their waste signed up to participate received email reminders and tips about living waste-free. 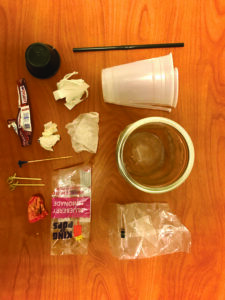 According to OSI Intern Jamie Nadler (17C), zero waste relies heavily on reusable items. She carries a water bottle, travel coffee mug, bamboo silverware set, tupperware container and reusable bag with her almost everywhere. Because living zero waste can mean many different things, mainly split between zero landfill waste and total zero waste, I set specific rules for the week: Use reusable items at all times. Shop and eat zero waste, but any food already purchased in my apartment is fair game. Wear only thrifted clothes to embody the zero waste initiative of reusability. Any waste I did produce that wasn’t compostable went into my waste jar. Even though Zero Waste Week hasn’t started, I went zero waste shopping today. I visited the produce section at Kroger (bringing my own reusable produce bags) and the bulk food section at Sprouts (bringing my own jars) and bought items including mushrooms, peppers, lentils and granola. Shopping takes much more thought when things aren’t pre-packaged and pre-proportioned. Because of the nature of zero waste food, I planned to eat largely vegetarian this week. In my first day of zero waste life, I quickly realized that living low-waste or zero landfill waste is doable given Emory’s recent recycling efforts, but living truly zero waste takes planning and effort. My first and largest faux-pas of the day took place during lunch at Highland Bakery at Goizueta Business School. I went there knowing they serve food with reusable plates and silverware. I remembered to request “no toothpick in my sandwich” (much to the surprise of the women taking my order), but, alas, I forgot to request no dressing cup. Thus, I carried a used dressing cup around with me all day to add to my waste jar later. I created almost zero waste today — minus a candy wrapper. The key to my success came down to carrying a reusable mug at almost all times. I now notice the sheer number of cups, plastic and paper that we waste in a day, which has made the idea of reusable cups and mugs truly inspiring. Zero Waste Week is largely about forming good habits, and I definitely noticed incorporating reusability into my routine getting easier. At Wonderful Wednesday today, I was a lot more conscious of the waste that I could have contributed. I also noticed my friends becoming more aware of their waste. They asked about what items are truly recyclable and took extra time to sort their trash before recycling or composting. My biggest piece of waste today was a King of Pops plastic wrapper. Today I packed my own snacks so I wouldn’t get hungry and create waste — my largest zero waste initiative of the day. That said, zero waste may not jive with all college students. When I went out with friends, plastic cups and straws were everywhere and I almost panicked. Enjoying the perks (drinks) of young adulthood while living zero waste felt near impossible and was a challenge I was unprepared to face. I made it. The week wasn’t as crazy as I imagined. Sure, living zero waste takes careful intention, but it can easily become second nature while living on campus. One could say I failed because I did create waste, but I significantly cut down on my usual waste. More importantly, I became aware of many simple sustainable practices. In hindsight, I also did a poor job of estimating how much of the dry bulk goods I would need. I have lots of leftovers. I owe a large part of my success to Emory’s continued efforts towards waste reduction. Access to compost bins 24/7 and the willingness of Emory Dining Services to accept reusable containers was crucial. Even with Emory’s impressive strides in sustainability, there’s still more that can be done, especially around education and attitude. Nadler said that one of the largest issues to enhanced sustainability on campus is a lack of motivation to learn. People were confused and amused by my week-long commitment. As entertaining as it might be to shop with mason jars and to refuse toothpicks, a positive attitude is crucial for a serious acceptance of sustainable practices. I agree. Living a sustainable life is not only important, but can also make you more thoughtful. We don’t all have to live zero waste, but we should at least make conscious efforts to reduce, reuse and recycle. Doing so is part of our responsibility as both Emory students and people on Earth. So go pick up some litter or something, and be sure to recycle this paper on your way out.